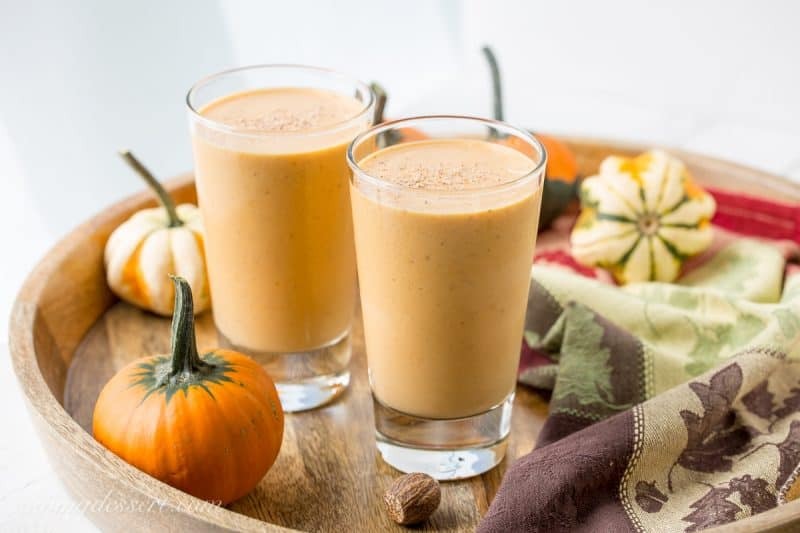 Watch our simple how-to video for this delicious Pumpkin Pie Smoothie! What kind of food blogger would I be if I didn’t post a creamy and delicious Pumpkin Pie Smoothie? A hungry one I guess! I’ve resisted making a pumpkin smoothie because I didn’t think I’d like it. Was I completely wrong! After making a pumpkin pie last weekend I had a little canned pumpkin left over. I am so glad because this was great. I went back to the pantry to make sure I have another can of Libby’s 100% Pure Pumpkin because I’ll make this again and again. It tastes like pumpkin pie to me but it’s healthy, filling and completely appropriate for breakfast. Check out these adorable gourds and pumpkins. We picked these at a local farm – three for a dollar! What a deal and what a fun day with our grandchildren. The little ones get such a thrill from picking their own pumpkins. 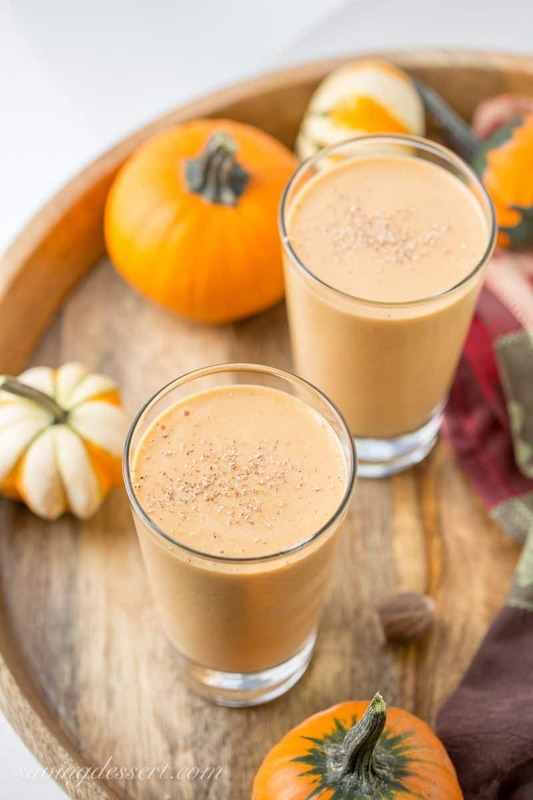 Thick, rich, healthy and creamy – it tastes like pumpkin pie in a glass. When you’re craving pumpkin pie but don’t have time to make one, this is a fine substitute. Don’t forget to PIN to your favorite Pumpkin Board! Let’s be cooking friends! If you try our recipe please feel free to leave a comment on this post. I’m sure your experience and insights will help our readers, and me too! Also if you’re on Pinterest, feel free to leave a comment and photo there if you have one! If you share on INSTAGRAM use the hashtag #savingroomfordessert so we can stop by and give your post some love. And we’d be very happy if you’d FOLLOW Saving Room for Dessert on FACEBOOK| INSTAGRAM| PINTEREST | TWITTER and subscribe to our YOUTUBE channel for all the latest recipes, videos and updates. Thank you!!! 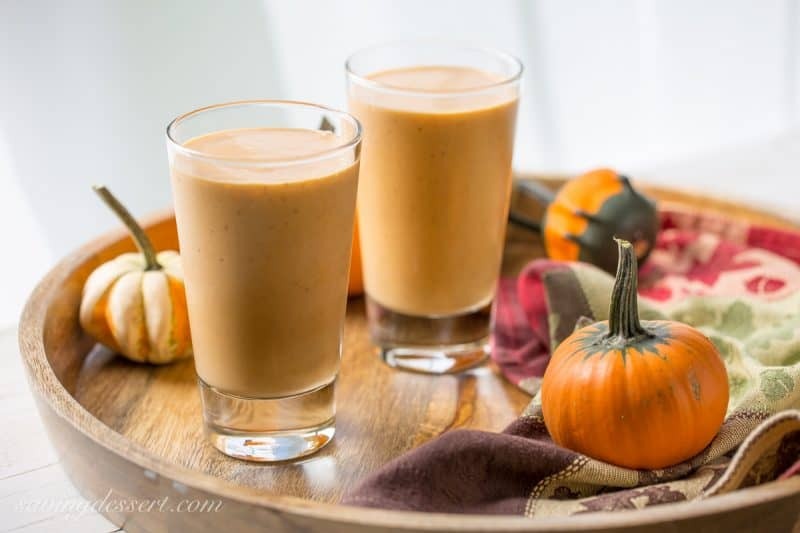 A healthy slice of pumpkin pie in a cool and creamy smoothie. Thanks so much for stopping by! I’m pulling out a nice recipe for classic comfort food this weekend. And I’ll be making pie No. 45. So close …. I’m getting down to the last few! Have a terrific weekend – I can’t wait to see what you are all cooking up too! Loved the video! What a delicious treat, Tricia. It looks so creamy and tasty. Thank you very much Susan! It is a tasty treat and I just can’t get enough of it. Have a wonderful week! Love pumpkin pie. And now I’ll be able to drink it! Genius! 🙂 Really super recipe — thanks. Thank you John – have a great week! I just love this smoothie Betty! Hope you enjoy it too! Yay, love the video and love this idea for a fun drink, definitely making it for the kids who are pumpkin crazy right now! Thanks so much Sara. I bet the kids will like it – I could drink one everyday! Have a great week and thanks. I cannot wait to go to the grocery store, pick up some of those ingredients and make myself and my hubby a delish pumpkin pie smoothie. I also included my email to be included in all of your delicious recipes. Hope all is well and Ed is recovering nicely. Thanks again!! Hi Heidi! Thanks so much for commenting – it’s great to hear from you and thanks for signing up for emailed posts. So happy to have you be a part of our SRFD family 🙂 Ed is doing much better today, the worst is over. Have a wonderful week and enjoy the smoothie. I love it and also love that you can sweeten it as much or as little as you want with your favorite maple syrup, honey, sugar or whatever! Enjoy! Thanks Monica. I love this every year and look forward to leftover canned pumpkin so I can make this. You can make it as sweet as you like so it would taste more like pie but I love the flavor with just a little honey. Hope you were able to see the video – I checked it on my desktop and iPhone and it seems to be working. Sorry! SUPER VIDEO, TRICIA!!! 😉 I was expecting to hear your voice! LOL Your Pumpkin Smoothie looks WONDERFUL!!!! I’ll HAVE TO try this one! 😉 I think my hubby would like this one too. Haha Becky – you won’t catch me doing any voice overs 🙂 Thank you so much for the kind words. I love this smoothie and can’t wait to make it each fall. Hope you like it too and thanks again! 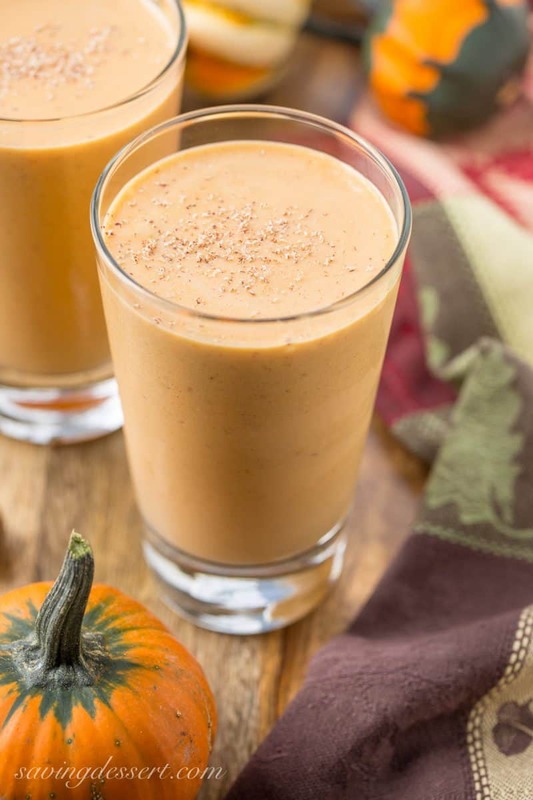 I have never had a pumpkin smoothie, but yours looks so delicious that I might have to try it. I can’t wait until pumpkin time comes around each year so I can make these again. I really love them and find them filling and satisfying. Thanks for stopping by Gerlinde! Hi Tricia, love your video, the music everything. Way to go. Also this smoothie looks delicious, can’t wait to try myself. Thanks Cheri! It was fun to make and thank goodness my husband is a great editor – he did amazing things with my funny video! The smoothie looks amazing and would really be perfect any time of the day, breakfast, lunch, dinner or for an evening snack. Bravo, the video is awesome! It’s a tasty treat for sure Chris. Hope you’re having a lovely trip. What a perfect way to start the day (or end it!). Sounds perfect for any time of day and I’m all about the pumpkin flavours right now. LOVE the video!! I have loved this smoothie for years and whenever there is just a little leftover pumpkin – this is what I make. Thank you so much Jennifer! what a lovely idea… i’d assumed you’d just a whole pie in the blender but clearly I was wrong! We don’t really do the whole pumpkin pie thing here in the UK but this i’m sure will catch on! We do love our pumpkin here in the US Dom – hope you get to try this someday! What a delicious seasonal smoothie! Can’t go wrong with the combo of Greek yoghurt and pumpkin. Love it! Thanks Angie – it is an annual favorite of mine! The video is AWESOME!!! I need to go make myself ANOTHER pumpkin smoothie! Thank you so much Sue! I just love this smoothie and it was fun to make the video. Have a lovely week! Excuse me while I go make myself a pumpkin smoothie ~ I’m now OBSESSED! Haha – I am a little obsessed too – it’s just so easy, delicious and healthy! Oh my goodness … I love everything with Pumpkin and a smoothie? Well you are a genius!<br />Love this !!! This looks GREAT, Tricia. I tried making a pumpkin smoothie yesterday morning and was completely unimpressed. Your version sounds delicious though! I definitely make this one! Nutritious and healthy!